Intel has recently updated its line of Xeon processors, and as such we present to you our test of some of the new low-power Xeons. For our test we have a pair of Xeon L5640s. 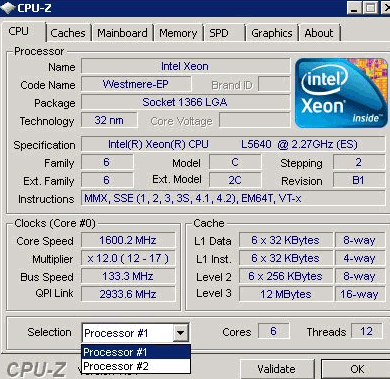 These are hexcore processors with a default clock speed of 2.2GHz, though this can rise to 2.5GHz if TurboBoost is active. The processors have a TDP of 60W each, which is just 10W per core, and are also fitted with Intel's HyperThreading technology, allowing each processor to present 12 cores to the OS (24 in total). Curious what bios version you guys are running on the SR-2 and if the L5640's worked out of the box without a bios flash....thanks.